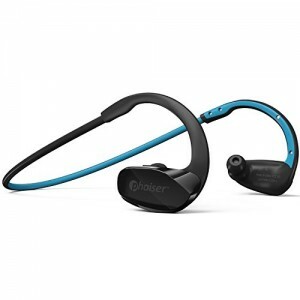 Look No Further – This Bluetooth Headset Has It All! No More Choppy playback, weak batteries, dropped phone calls… Not all Bluetooth headsets are created equal! Bluetooth 4.1 increases Battery Life dramatically while letting you travel further than ever before. The Easiest Way to Manage Battery Life. Our new LifeStateTM technology interfaces with Apple iOS and latest Android devices to show you at a glance how much battery life is left in your headset. The BHS-530 uses the highest quality transducers and hardware, as well as Bluetooth 4.1, and A2DP stereo transfer protocols. That means bigger bass, lighter-than-air treble, and perfect phone call clarity EVERY time. We designed the BHS-530 so that it’s an extension of your own body. It’s sturdy and comfortable, but lightweight and super sweat-resistant… making it the perfect solution for home, gym, work and traveling. Comes with The Original Phaiser Travel Pouch… for FREE! Usually $10 – $15, this high quality Carrying Pouch provides Full Protection for your Earbuds on every trip you take. Made of Hard Foam and with Space for All the Accessories, the Phaiser Case will be the one thing you sure won’t forget to bring along! 30 days is good, but 60 days is even better. No questions asked, no strings attached. Go to the Top of the Page, click the Add-to-Cart-Button and Order Your Set Right Now, Before they are All Gone!HD SOUND – 10mm Speakers combined with Bluetooth 4.1 create super accurate HD sound with powerful bass. The bullet-shaped Comply T-400 M memory foam tips provide Total Isolation from external noise.